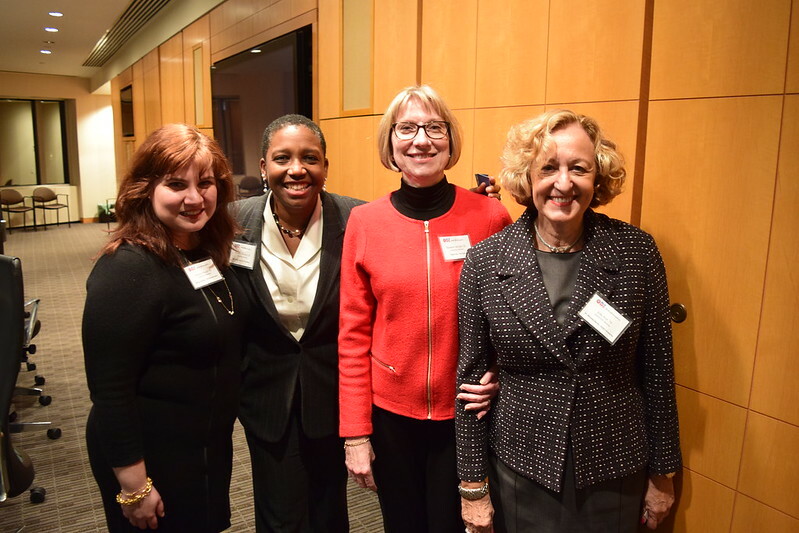 Women's Leadership Network (“WLN”) supports and encourages the development of leadership skills in our students and young alumnae by providing opportunities to collaborate with each other and to network with more experienced career women who support St. Francis College. This network will be used to empower our students, reconnect with our alumnae and network with new friends while growing the resources of SFC through professional, educational and social events. While the College was established in 1859, it went “officially” co-ed in 1969 with the 13 female students in the first class. Today, females comprise over 60% of the full time undergraduate student population and 52% of the graduate population. Women's Leadership Network ("WLN") at SFC is celebrating 50 years of educating women this year. The Women Leadership Network at SFC cordially invites you to First Impressions: Insider Tips on Resume Writing, Managing your Internet Presence and Acing Your Interview on Wednesday, October 25th from 6-8pm @ SFC. The goal of this event is to combine the expertise of our professional alumnae community with the interests of our female students. The first part of this program will feature interactive presentations while the second half will be dedicated to networking. If you have professional skills and experiences that you would like to share with our students, please contact the Office of Development (718) 489-5483 for more information. Swing by grab some popcorn and see what it's all about! Support SFC during this important, international day of giving. Celebrate four scholarship winners through the generosity of Investors Bank, as well as clubs that have gone above and beyond with volunteer experience! Renowned American playwright Dominique Morisseau, recipient of a 2018 MacArthur Foundation "Genius Grant," will take part in a live Q&A discussion at St. Francis College on Wednesday, March 27th. Moderated by St. Francis senior Janelly Aybar, a biology major who was a Research Assistant for NYP/ Weil Cornell Medical Center HeartSmarts program and a scholar at the Rutgers Summer Health Professions Education Program, the panel discussion is co-sponsored by SFC's Women's Leadership Network and the Biology Department. It commemorates 50 years of co-education at the college. Submissions are now open online for the 2019 festival, which runs from April 4-6, 2019 and will screen films in seven different categories including female student and non-student Narrative Shorts, Documentary Shorts, Animated Shorts, Virtual Reality/Immersive, Experimental, and Youth Shorts. Judy A Rice '76, Chief Diversity Officer, Prudential Investment Management & former President and CEO of Prudential Investments. In 2013, Judy Rice became the Chief Diversity Officer for Prudential Investment Management reporting to the President and CEO of PIM. She is responsible for key programs that include development, education, and training with the goal of creating an internal and external presence for PIM to increase its profile as one of the best places to attract and retain top diverse talent. Prior to becoming the Chief Diversity Officer, Judy was the President and CEO of Prudential Investments for 8 years where she was responsible for the manufacturing and distribution of retail mutual funds. She is ranked among the investment industry's most influential executives, and has been an active participant in Prudential's women's affinity groups. She recently received a Women of Excellence Activist award from the National Association of Female Executives. She served on the board of directors of the Investment Company Institute and was an officer of the Prudential Retail Mutual Fund Board of Directors. Judy graduated St Francis College with a degree in business administration. Judy recently retired from Prudential at year end 2015. Elizabeth Mindlin ‘81, Vice President, Federal Reserve Bank of New York. Liz was responsible for the Bank’s operational risk program, its business continuity planning and the Bank’s process of evaluating and monitoring major infrastructure and automation projects. In that capacity, she was a member of the Federal Reserve System’s National Business Continuity Planning Committee and served as an adviser to a variety of foreign central banks implementing such programs. Prior to that, she served as Vice President in Human Resources responsible for compensation, benefits, payroll and automation and served on the System’s national Benefits and HR Automation Oversight Committees. Liz’s earlier career experiences at the Fed included assignments in a variety of accounting and finance-related areas such as Auditing, Accounting and Budgeting where she was often responsible for the implementation of new automation systems. Liz holds a B.S. in Business Administration from St. Francis College and an M.B.A. from NYU. Since retiring from the Fed, Liz is the Treasurer of her co-op, is a member of the Steering Committee that oversees the Central Park Conservancy’s tour program, and serves as the Fundraising Chairperson for Manhattan TaxAide (a free tax preparation service for low income elderly NYC residents). Saundra Thomas ‘10, honorary doctorate in humane letters from St. Francis College. Vice-President of Community Affairs at WABC-TV since 2001, has made community service the center of her life. Thomas is in her 28th year at Channel 7 and after years of writing and producing on-air topicals for Eyewitness News and award-winning ABC7 special programs, she has gone on to combine her creative skills with her need to serve. In her current role, Saundra Thomas oversees all on-air public service announcements, community outreach and station community projects for the tri-state. A recent candidate for New York City Council and an active board member, Thomas has served as a board member of Jazz Reach and Global Action Project and is currently serving on the New York Women in Communications Foundation Board, and the current board chair of both Dancewave and Council for Unity. Thomas also sits on the advisory boards of The Grace Institute and Services for the Underserved. Thomas holds a B.A. in Journalism from Rutgers University and an M.A. in Media Studies from the New School. She is a proud and enthusiastic resident of Ditmas Park, Brooklyn, where she lives with her family. Dyanne Rosado ’95, is currently a Director of Human Resources – Lead HR Business Partner at Nasdaq in New York City where she assumed the role in August. Dyanne joined Nasdaq from Cantor Fitzgerald/BGC Partners where she had been for five years and most recently served as the Deputy Director of Human Resources. Dyanne specializes in Financial Services Industry HR and has worked in a variety of human resources generalist and program management roles at Brown Brothers Harriman, MetLife and PricewaterhouseCoopers. Dyanne holds a Master of Arts in Organizational Psychology for Human Resources Management and Leadership Development from Columbia University Teacher’s College. She graduated from St. Francis in 1995 with a Bachelor’s Degree in History, having served as Student Body President during her senior year. Dyanne lives in Brooklyn Heights with her son Gabriel. She has served on the Alumni Board of Directors at Packer Collegiate Institute, the Parish Council at St. Charles Borromeo, the Yuletide Committee of the Brooklyn Kindergarten Society and most recently as a Board Member of Musica de Camara. Her family has several St. Francis College graduates, her: brother, Ernesto Javier Rosado Toro ’87; mother, Gloria Landron Rosado ’92; and sister, Maria Cristina Rosado Landron ’98. For more information on WLN and ways to get involved, please contact development@sfc.edu or (718) 489-5361.